May the blessed feast of Your saints, Cosmas and Damian, glorify You, O Lord; for on this day in Your marvelous providence, You gave them glory everlasting, and gave us their help. The Station is at the church of Sts. Cosmas and Damian, physicians. These martyrs were twin brothers originating from Arabia. They practiced medicine in Aegea, Cilicia, but accepted no money from the poor. Their beautiful Christian lives edified the pagans and converted many to the Faith. They were arrested in the persecution of Diocletian, subjected to torture, and finally beheaded. According to tradition, Cosmas and Damian were twin brothers, born in Arabia, who studied the sciences in Syria and became eminent for their skill in medicine. Filled with Christian charity, they practiced their profession without taking payment from their patients, and on this accounted they were surnamed in the East anagyroi (?the moneyless ones?). During the persecution of Diocletian, they were apprehended in Aegea in Cilicia by order of the governor Lysias, and after various torments ? including trial by drowning, burning, and crucifixion ? they were eventually beheaded. Their bodies were carried to Syria and buried at Cyrrhus, which was the chief center of their cultus. Later their relics were brought to Rome, and the reception of their cultus here is an early example of the orientalization of Roman cult, which reached a crescendo in the seventh century. The body of the church was built by Vespasian (69-79) as the templum alma urbis to conserve censorial records, municipal street plans, etc. 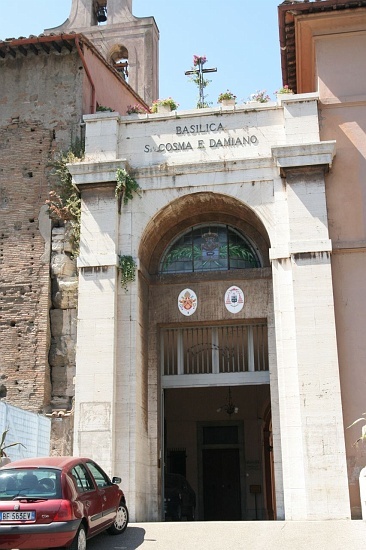 The circular vestibule opening onto the Forum was constructed by Maxentius, possibly as a mausoleum for his son (the so-called ?Temple of Romulus?). Originally, the external wall was clad with about 150 marble slabs incised with a street map of Rome at the time of the Severi (3rd century AD) known as the Forma Urbis. Felix IV (526-530) united the two structures and rededicated them as a church, the first such appropriation in the Forum of pagan temples. Urban VIII (a Barberini, 1623-1644) solved the problem of dampness by building a new floor across the middle of the church, creating a lower crypt and an upper church of unusual proportions. Note the pleasant 17th century cloister, the street plan of San Severus in the back of the church, several typical baroque paintings, and one of the finest apse mosaics in Rome, installed by Felix IV (526-530) and frequently copied: Christ coming on the clouds with Peter and Paul, Cosmas and Damian, and Theodore and Felix IV presenting the church. Despite the overall Byzantine style, Christ is depicted in a Roman manner. They stand on golden water plants, symbolizing the River Jordan. On the triumphal arch, the enthroned lamb with motifs from the Apocalypse is also very beautiful. The ambone and baldachino were added in the seventh century. One curiosity is found in the series of 17th century depictions of saints below the mosaic. Included with the Franciscan women on the right side is Saint Bridget of Sweden in a Franciscan habit. Though not Franciscan, she did wear a widow?s costume and thus was often mistaken as a member of the Order. Cosmas and Damian are named in the Roman Canon at Mass. With St. Luke, they are patrons of physicians and surgeons. Their church here is one of the nineteen urban deaconries of Leo III (795-816) and was erected as a station by Gregory II (715-731). It is cared for by the Third Order Regulars of Saint Francis. Location: facing into the Forum just north of the Basilica of Maxentius. One enters from the Via dei Fori Imperiali. May Your heavenly favor, O God, increase the number of Your subjects, and help them always to obey Your commands.